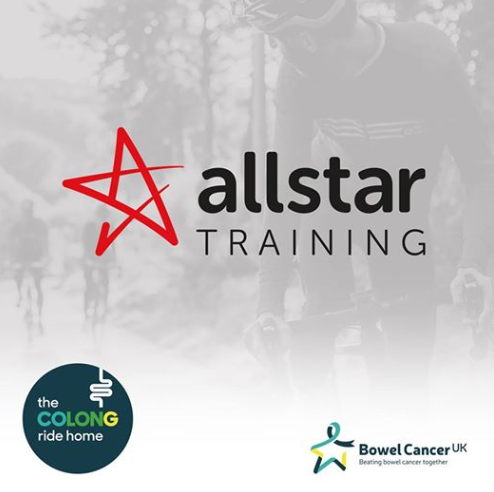 Allstar Training are proud to be a sponsor for Guy Clubb fundraising for Bowel Cancer UK and the CoLonG Ride Home. Guy is a good friend of the company and a supplier for our branded merchandise. Our Director, Richard Dean will be supporting Guy on Day 2 of his journey for the last 120 miles home. Richard is participating in his first full Ironman in July so this should be good practice for him! “My Dad was diagnosed with Bowel Cancer in 2010, thankfully he’s still here to tell the tale, but not everyone is quite as lucky. So in order to raise awareness and to fund vital research into improving prevention, early detection and treatment of the disease I’m planning to ride my bike from Scarborough in Yorkshire (where a large portion of my Dads family are originally from) 282 miles back home to Copdock, Ipswich in 2 days. I’m hoping that as many of you as possible will join me for part of the ride, whether it’s the first 40 miles or the last 2 miles. It’ll be great to see some friendly faces along the way and hopefully make as much money as possible for a great cause.